Home Case Studies Frankie L.
First Entry: April 20, 2011: This is a story about Frankie…who came out a champ. I’d like to preface this story letting everyone know, she’s alive and well, so that you can feel assured that there is hope. Frankie was rescued from the Santa Ana, California animal shelter on June 11, 2002. Frankie is strictly an indoor cat, spoiled, loved & adored. She has a hearty appetite yet she’s a petite 5.75lbs. She had always eaten Science Diet dry cat food but someone once told me that there isn’t enough protein in that food so I switched her to Before Grain dry cat food. Now that I think back, she has been vomiting since about the time of the switch. She’s been on that food for maybe 2 years. She would vomit up her food still in kibble form, and then eat it. Then it progressed into vomiting up a clear white foam, and later into just bile which was a yellow-green color. It would happen maybe a few times per week and wasn’t always consistent. I thought she was doing it on purpose, because maybe that day I worked late or was on the computer too much. I would ask other cat owners and they would say their cat did the same thing, nonchalantly as if it were just a “cat thing”. So I thought nothing of it…until Frankie started showing signs of depression. Then the vomiting was happening every day, sometimes twice per day. And that’s where it all began. April 4, 2011: I took Frankie to a vet she had only visited twice in the past for her vaccinations. The vet pulled blood and urine. He examined her teeth, her gums were bleeding and he said she needed to have her teeth cleaned and that her teeth could be causing her to have an upset stomach. During the body exam he said that he could feel something in her stomach but suggested that it may just be stool. Frankie was sent home with Reglan syrup (anti-nausea). $333 bill. 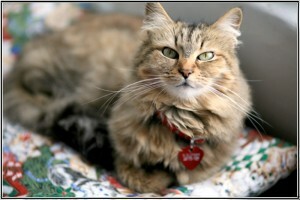 April 5, 2011: The vet calls to inform me that the blood and urine results came back. Her results weren’t bad but nothing “too exciting” as he said it. He said she just has a little GI infection and should be on antibiotics. Night one, Frankie sleeps under the bed which she doesn’t normally do, so I know something is not right. $25 bill. April 6, 2011: Start Frankie on the Clavamox drops. She continues to vomit. Night two, I wake up to find her sleeping under my dresser, which has never happened in the past 9 years. So I knew something was really wrong. My gut is telling me this vets relaxed demeanor about a little GI infection is something more serious. April 7, 2011: I take Frankie to the veterinarian she had always seen since she was a kitten. I trusted this vet, I only stopped going there because it was a distance to drive since I had moved. I provided copies of the blood and urine samples done at the prior vet. This vet said there was nothing unusual showing. So an x-ray was done and showed what the vet described as a large mass above her stomach. Her colon was completely empty which the vet said was very unusual. He said they should schedule an ultrasound and at that time they would do a biopsy to determine if the mass was cancer. She was admitted into the hospital overnight. She was on IV fluids and given Covenia, an antibiotic injection. $239 bill. April 8, 2011: The ultrasound results came back and showed that Frankie had an inflamed pancreas and her entire bowel was inflamed. It wasn’t a mass, she was diagnosed with triaditis. They informed me that Frankie wasn’t eating in the hospital but that it wasn’t unusual for cats. She was on an IV to keep her hydrated and they suggested she stay in the hospital, which I agreed. She was given cefazolin, an antibiotic injection, B-complex injection with fluids, dextrose and an injection of Percorten. April 9, 2011: Frankie is released from the hospital and sent home with Carafate and 3 cans of Hill’s Prescription z/d low allergen feline food. She’s on a very strict diet, no more of her favorite Whisker Lickin’s, Natural Sensations,Bonito Flake treats or catnip. They informed me that she is allergic to something that she is eating so absolutely nothing other then the z/d food. Bill $820. Sent home soaking wet in her own urine. They said she refused to use the litter box once the catheter was removed. On the ride home she was using all of her might to try to get out of the carrier, which she had never done before. So I knew she was stressed. We arrived home at noon, and after a quick bath Frankie slept the entire day away. Then, she woke and vomited twice a profuse amount of a dark brown liquid. And crying as she was vomiting. She then went back to bed. I didn’t want to take her back to the vet because I knew she didn’t get any rest there, and I didn’t want to stress her out any further. I thought that rest in the comfort of our home would be what she needed. So I called as many 24 hour emergency vet clinics as I could to prepare for the worst. I was googling everything I could to try to find out what I should do, what this disease is capable of doing, is it life or death, googling the medications that she was given and so forth. And when I googled the Percorten medication, everything that came up said it was a medication for dogs. So I began to worry that maybe she was given the wrong medication and that’s why she was sick. Now not trusting this vet, I called the emergency clinic and they said they couldn’t understand why she would be given Percorten. My friend stressed to me that I take Frankie to her vet, a cat only clinic, whom saved her cats life. But it was Saturday afternoon and they were already closed. And closed on Sunday. By now my gut was telling me I needed to take Frankie to the cat only vet, praying that she can hold on for another day and a half. April 10, 2011: She didn’t eat anything at all that day. But after all my googling, a lot of websites were saying that food should be refused for up to 24-48 hours to basically give the insides a rest from vomiting. So I thought maybe it was okay, but then she vomited twice. 7am I wake up and Frankie can’t be found anywhere, she’s hiding under the couch. How she got under there seems nearly impossible since my couch is only about 1/2 an inch off the ground. This is crazy odd behavior so now I’m really scared. She was extremely lethargic, visibly had lost weight, her eyes were sunken into her head and I was literally preparing for her death. I thought I would keep her at home in peace. I drove to the vet that hospitalized her and asked a doctor to review her chart with me. He was unavailable so the vet tech reviewed it with me. She assured me that Frankie wasn’t in any pain, that the injections that they had given her would help relieve the inflammation which would be the cause of the pain. I informed the vet tech that Frankie was urinating and still using her litter box, still grooming herself and drinking water. The vet tech confirmed these were all good signs but that I should have brought her in, that the doctor suggests I bring her back. But I saw how stressed and sick she was when she left the hospital, I didn’t want to take her back to that horror. I asked the vet tech for a copy of her chart (so that I could take it to the cat care clinic) but they denied me. They said they would have to get approval from the Chief of Staff and that it could take up to 1 week. I couldn’t understand why my request was denied. Frankie slept under the bed that night. Again googling away to see what I should do, what I could find, what I could learn. And I was blessed to have my email of concerns answered by Lisa of IBDKitties. 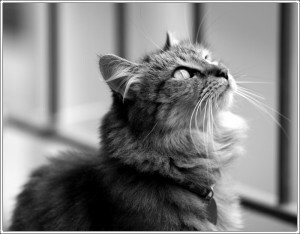 April 11, 2011 (day 7): I call The Cat Care Clinic at 7am and expressed the urgency and they kindly took me right away. Amanda Page, D.V.M. was incredibly thorough in her questions and answers. She was calm and gentle with Frankie…Frankie was completely relaxed like she had never been at any prior vet visits. Dr. Page said that Frankie was well hydrated but that she was in pain. Which killed me because the vet tech at the other hospital said Frankie wasn’t in any pain. She had lost weight, barely making 5lbs now. She was given an injection of dexamethasone sodium phosphorus, Cerenia, Pepcid (famotadine) and given a pill called Remeron (mirtazapine) to stimulate her appetite. We were instructed to stop all other medications given to us. She was sent home with Cerenia tablets (anti-vomiting and nausea), Remeron (appetite stimulate anti-nausea), buprenorphine transdermal (pain killer that your rub on the inside of their ear flaps) and prednisolone (steroid). On the drive home, she looked as happy and relaxed as could be. Once home she walked out of her carrier exploring everything and ate right away. Vocal, extremely restless and quite frankly acting high on drugs (a normal side effect from the Remeron) A TREMENDOUS noticeable difference literally within 2 hours. Instructed to mix baby food with her Hill’s Prescription z/d. Bill? Surprisingly modest, the most conservative of all 3 vets. Now that was the best money I’ve ever spent. Worth every single penny. Dr. Page at The Cat Care Clinic in Orange California saved Frankie’s life. Frankie’s new nickname? “Piglet”. She’s still on the Hill’s Prescription z/d canned food. Her hearty appetite is back, she has her pep back in her step and her curiosity is back, exploring our apartment each day as if it’s a brand new mansion we just moved into. I‘m incredibly grateful for Dr. Page. Through this experience I’ve learned, don’t try to be your own vet and diagnose your cat based on your google findings. Don’t ignore health concerns that repeat themselves, your cat is trying to tell you something, take your pet to the vet. Follow your gut instincts. If you can, see a cat only vet. Your pet will thank you for it. Lastly, I’ve learned, there are still people left in this world who are kind and can offer a helping hand to a stranger. I thank Lisa for creating IBDKitties on behalf of her Alex. Thank you for sharing Alex’s story, and I thank you for allowing me to share Frankie’s story so we can continue helping others. May 15, 2011: This was Frankie’s second check up and she lost a little bit of weight was 5.3lbs now down to 5.18lbs. So we’re going back to one full prednisolone pill per day and continuing with the other med for her cold; these will be life long meds. Use Remeron & Cerenia as needed otherwise she’s doing great. October 23, 2011: Ever since Frankie got sick the vet put her on Prescription Hills AD but that stuff is expensive, so I was looking for alternatives. She’s doing great! I honestly think I found the culprit to all of that pancreatitis stuff, a treat called Natural Sensations, her absolute favorite. I took her off the treats when she got sick and recently gave them to her again because she was deprived of everything else. You would think these treats have crack in them because she literally goes wild even when I dare say the word “natural sensations”. After about 2 weeks of the treats, the vomit started again. She’s not on any medicine at all, I took her off all meds maybe a month or two back because she’s been doing great and quite frankly being on the meds, made her seem lethargic. She’s only recently taken up a few bad habits after being a complete angel her whole life, that has been peeing on purses or rugs randomly and no longer uses her favorite item…her scratching post. She’s been in love with that scratching post (the same one for 9 years mind you) and now will walk up to it, look at it, and walk away. And now chooses to scratch the sofa. She’s never done that in all the 9yrs I’ve had her. She bites her toenails CONSTANTLY. I mean and it’s loud! She’s always had her nails trimmed since a kitten so I don’t know why all of a sudden she’s taken on biting her nails. I took her to the vet and they checked her for a UTI, everything came out clean. They had me fill out a questionnaire and the vet says that it’s a behavioral problem, that Frankie is stressed or upset about something and that’s why she’s randomly peeing on things. She’s only done it 4 times in the past 4 months so it’s not so bad, and the scratching of the sofa, it’s not so bad it’s the biting of the nails that’s pretty annoying. The vet suggested Feliway and that hasn’t helped at all. The only thing I think it could be is her feeling MY stress for things going on in my life in addition to the neighbors cats who climb on the roof and taunt her. Regarding the Triaditis, she’s been doing terrific! July 18, 2012: Frankie had been doing great and JUST got sick 2 weeks ago (but I’m certain this is because she was stressed because I was gone I had been in the hospital). Docs gave her the regular meds and she’s been doing pretty good since. She’s lethargic but I think it’s because of the meds, for 5 days she’ll be on predisinone, Cerenia and metronidazole. But her appetite is GREAT. I think the culprit to her latest flare up was Whisker Lickins treats and the stress of me being in the hospital and all these people coming into my apartment to look after her. No matter how much you want to give your cat treats because they deserve good things in life, that these type of treats are an absolute no-no. She would go crazy for them so I’d want to give them to her to reward her for being a good kitty, but it just ended up doing harm to her. November 1, 2012: Frankie had a very bad set back about a month ago. For the first time ever in her life she had uncontrollable diarrhea throughout the house, and howling in pain during. Took her to the vet and back on prednisolone, Cerenia, metronidazole for 5 days and she was good again. Then this past Sunday she started vomiting greenish/yellowish vomit and it sounds like strained breathing and almost congested breathing so I took her back to the vet yesterday. They gave her a long acting injection of Clavamox and now for the rest of her life one daily oral injection of metronidazole, 1/4 Cerenia 5 days a week and 1/2 prednisolone every other day. The vet said I can try a diet change from Hills Prescription a/d to z/d instead of the daily meds. But, for the first time in her life she’s finally gained weight, at 5.98 lbs. She’s not herself lately, lethargic and mainly distant. But, the flare ups strangely only happen here and there (no table scraps and no treats). January 10, 2013: Frankie has had a rough time and has been at the emergency clinic since Wednesday 10 pm. Three weeks ago it sounded like she had bronchitis so they gave her an injection and Tuesday I made the mistake of giving her a treat (although freeze dried natural stuff) and an hour later she was feeling horrible. Wednesday her breathing had abdominal labor and I waited too long it got intensely worse; rapid and short, however very labored breaths and took her to the ER. Her X-ray showed lots of white cloudiness and on a 1-10 scale she was a 2. I was beside myself. They’ve had her in an oxygen tank since then and today she’s FAR improved on attitude, no more open mouthed breathing and labored breathing is still there but not so intense. Vet says she’s about a 7 now on a 1-10 scale. They’ll be doing a heart ultrasound but the radiologist said from the looks of the X-ray and fluid leaking in her chest that it looks like heart failure. She’s staying overnight again because when they tried to lower the oxygen her breathing dissipated again. However her attitude is great she’s alert and very curious. They said they’ll do the heart ultrasound today and said it may be manageable with a daily pill. But she’s been on prednisolone, cerenia 5 days a week and metronidazole daily for the past month say so they said meds may have to be altered. January 11, 2013: Dr called this morning, Frankie has greatly improved. She’s been on room air for the past 3hrs and is eating a good amount, drinking water and curious for being such a nervous cat in unfamiliar surroundings. He said she does have a heart condition so that we will have to change the management of her medications to target the heart problem. He did say that her being on prednisolone for so long (because her current vet has her on it 5 days a week for the pancreatitis) he said that has slowed things down for her because prednisolone retains water in the body which has been part of the reason Frankie was in an oxygen cage longer than most cats. He said we’ll be switching her a different type of steroid and adding other meds for her heart condition. The vet wants to keep Frankie overnight. He said because they’ve only given her 1 dose of the oral med to keep her off of oxygen. They want to monitor her to make sure she’ll be fine ongoing instead of releasing her and she goes backward overnight. Which I agree. January 12, 2013: Frankie is home. She’s been diagnosed with congestive heart failure. Instructed to see a cardiologist in a week for further examination. She is on a diuretic called Lasix to keep fluid from building up in her lungs again. This will be taken twice a day, 1 pill every 12 hours. She will decrease prednisolone from 1, 5mg pill taken every day down to .25 of that once a day. All he said was that prednisolone makes the body retain water and that’s why Frankie was on oxygen longer than most cats…that the prednisone played a part in that because it was causing her to hold more water in her body than normal. Months ago I noticed Frankie’s breathing sounding congested and her snoring more and coughing every once in a great while and a difference in abdominal breathing. And now look, she almost died and it cost me thousands when it could’ve been diagnosed back in November. The vet back then said her lungs sound normal but that they’d give her an injection for a bronchial infection. At that time I didn’t get x-rays at the vet due to money. Well this time the X-rays showed it all. Lastly the metronidazole and cerenia she can continue on. January 18, 2013: Frankie saw her primary vet today and had x-rays done again and they came out pristine, very clear, no relapse of congestive heart failure. They believe her breathing today may be from her asthma. Her vet brought something up; that this whole emergency room situation has happened after Frankie’s dose of prednisolone was increased due to her pancreatitis. She did also mention we need to treat Frankie’s asthma and heart murmur which I didn’t know she had a heart murmur. And I know her flare up of pancreatitis was because I gave her a treat. She feels the increase of prednisolone is what led to this whole congestive heart failure. So we have removed her from prednisolone. March 3, 2013: Wednesday night Frankie had to go to the emergency vet for labored breathing. The fluid had returned in her chest & she was given 50mg of lasix and a bronchilator. Sent home that night. Friday had her primary vet follow-up and they’ve said Frankie is not in good health and that her heart beat has slowed down. To keep minimal activity to not stress the heart. She’s now on 0.5mg of lasix every 12 hrs and 1/4 of 81mg baby aspirin every 3 days to prevent blood clots. I’ve asked her primary vet if it was time to put her to sleep and they said no, which I agreed. She still plays and is loveable, etc. They told me they of course would let me know when it was that time, but that ultimately it’s how she is at home. June 4, 2013: I have the unfortunate news that my baby Frankie passed away today, exactly 1 week before her 11th birthday. She had been doing great and we’ve been packing preparing for our move into our new apartment next Friday but she suddenly passed today. Maybe the stress of the move would’ve been too much for her and she felt it was time for her to let go. I came home from work today and found her curled up in her usual sleeping position on one of her favorite spots on the back of the chair and so I know that God answered my prayers and took her peacefully in her sleep. Otherwise I assume she’d be hiding somewhere where she would go when she wasn’t feeling well.